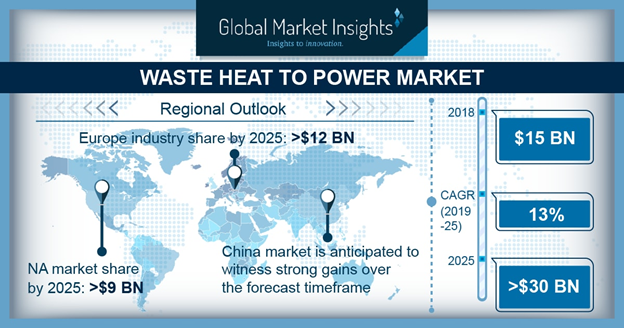 According to Global Market Insights, the waste heat to power market size will surpass USD 30 Billion by 2025.Resurgent economic growth along with rapid industrialization across key nations will drive the global market growth. Supportive policies coupled with government spending toward infrastructure development will further provide an impetus to the expansion of Energy Intensive Industries (EIIs) which in turn will complement the industry landscape. Furthermore, rising focus to reduce the overall operational cost of industries will thrust the deployment of WHP units. Increased focus toward heat recovery and utilization from industrial waste streams will fuel the market growth. The WHP systems are increasingly gaining prominence across energy-intensive industries owing to their ability to minimize carbon footprints and support clean energy initiatives. Escalating electricity demand and volatile fuel prices will further favor the industry outlook. Next articlePetcore: "EU Plastics Strategy 2.0"
Under the theme “EU Plastics Strategy 2.0 - Taking the PET industry to the next step”, the complete PET industry sector shared perspectives and strategies for a succesful and even more circular future.